→What Are the Best Red Wedding Dresses and How to Pick Up the Perfect One? 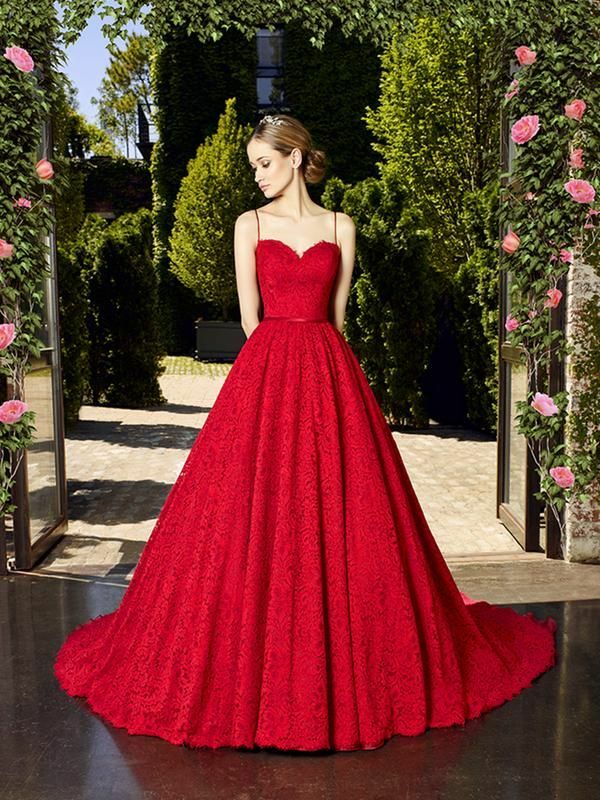 What Are the Best Red Wedding Dresses and How to Pick Up the Perfect One? Who has told you that you must wear a white wedding dress for your wedding? Though it’s a well-established tradition to wear a white gown for wedding, you are not obliged to be in white if you don’t want to. Remember that before Queen Victoria started the fashion for white gowns, the brides got married in the gowns of various colors. 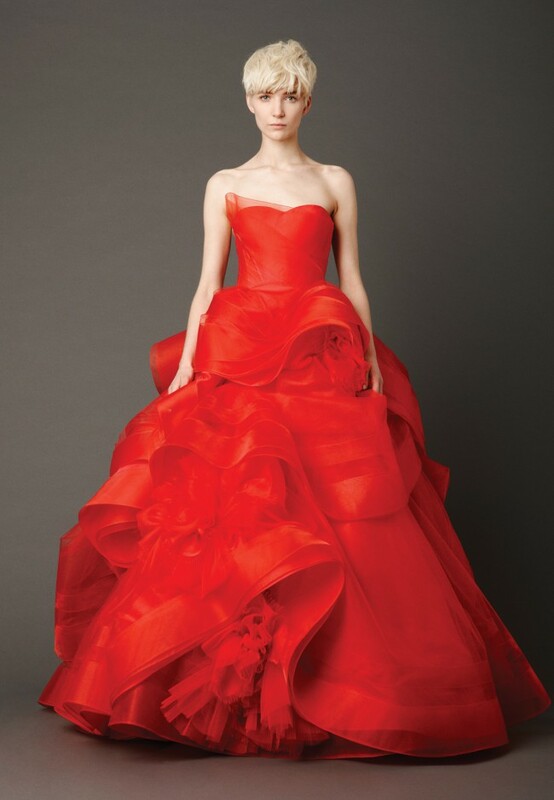 Are you dreaming about a red wedding gown? Why not? Though red wedding dresses are still considered alternative in Western countries, they are absolutely traditional in a number of Eastern countries, including China and India. But, in fact, the girl of any nation is free to be in red at her special day. Many wedding dress designers, including Vera Wang and Jenny Packham, create red wedding dresses and they look as gorgeous as the traditional white and ivory ones. Clearly, not every bride is ready to wear red at her wedding day, but if you are one of them, don’t be afraid to stand out from the rest of brides. Clearly, there are pros and cons of wearing red bridal gowns. Also, you need to choose them with much care as red isn’t so universal and it’s very important to choose the perfect shade, silhouette and embellishments. So, let’s get started and find out what the best red wedding dresses are and how to pick up the perfect one. Undoubtedly, a red wedding dress is rather a controversial issue. While some girls dream about getting married in red, the others consider that to be absolutely inappropriate. Before taking the final decision, have a look at pros and cons of wearing a red bridal gown. - If you are an active, strong and decisive girl, who likes to grab attention, red color is for you. None of your wedding guests will remain indifferent to a bride in red. - If you are getting married for the second time, you may want to have something different from a classic white gown. While the majority of brides still give preference to the dresses of pastel colors, you may be daring and wear a red gown. - Red bridal dresses always look creative. Even the most traditional wedding dress silhouettes and styles look absolutely different in combination with red color. - Red color has many shades. That’s why, you have an opportunity to choose the one, which suits you the most. Moreover, there are some subdued shades, which don’t look so provocative as scarlet. You may opt for burgundy, pale red and many others. - In many cultures, red symbolizes happiness, joy, beauty, health and wealth. It’s popular in India, Pakistan, China, Thailand and Turkey. - It’s not necessary to opt for an overall red dress. You can combine it with white and its shades or even with some other colors. - A red wedding gown doesn’t signify only the one in princess style. It goes in all the silhouettes and styles the traditional wedding dresses have. And so, you can choose any style, which suits your body type better and highlights your merits. - A red bridal gown is always a bit provocative. If you are a modest and self-conscious person, you may feel uncomfortable in a red wedding dress. Maybe, it’s better to give preference to calmer colors. - Be ready that some of your wedding guests may consider your wedding gown vulgar and too daring. 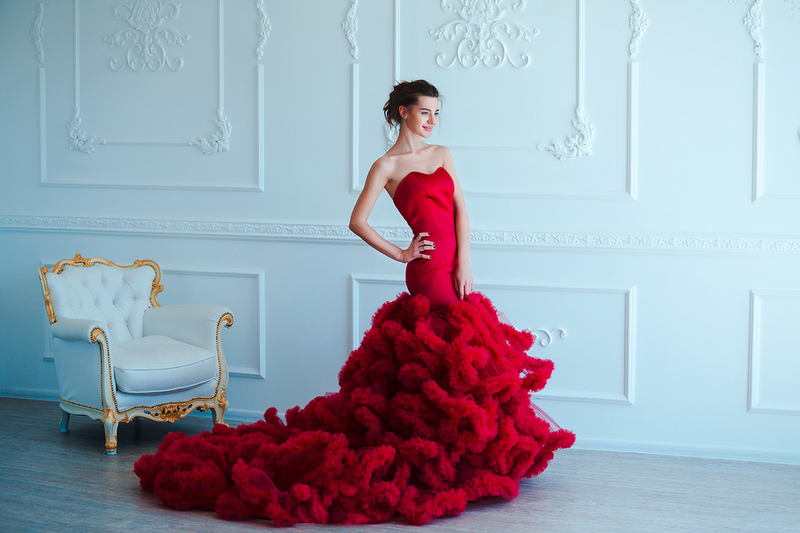 Red is still not a traditional wedding dress color and so, many people may simply fail to understand your intentions. - The choice of red dresses for wedding is rather limited, but you can easily cope with that problem by following our pieces of advice below. - A red bridal dress needs careful choice of wedding accessories and decorations. 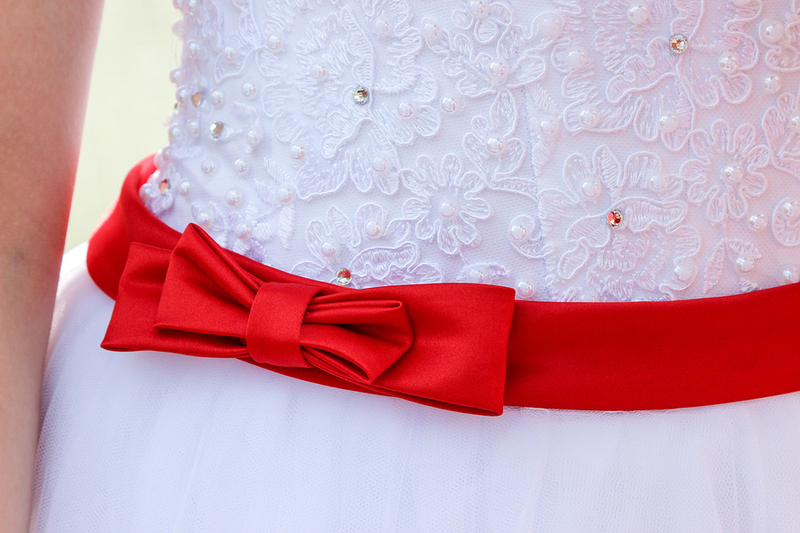 There mustn’t be too much red at your wedding. If you have already made up your mind to go to the aisle in a red dress, but still haven’t chosen the perfect one, have a look at the following tips, which will be helpful for you. - No matter the dress of what color you seek for, it’s extremely important to take into account the type of your figure. Stick to the silhouettes, which suit your body type. A-line gowns are rather universal and suit petite, plus size, pear- and apple- shaped girls. Mermaid dresses are good for the girls with hourglass bodies while ball gowns are great for boyish figures. - The shade of red for your wedding dress plays a very important role. Thus, it’s considered that brunettes look better with bright hues while blonds need to give preference to more muted shades. Also, red wedding dresses plus size look better in dark shades. In fact, it’s more than 20 different shades of red and it means that every bride is able to find the proper shade, which will suit her ideally. - If you are fond of red color, but aren’t sure that you want a fully red gown, think about red and white wedding dresses. They are a great mix of tradition and creativity. A bride in such a dress will look as bright as the one in a red one though her image will be more understood by the wedding guests. 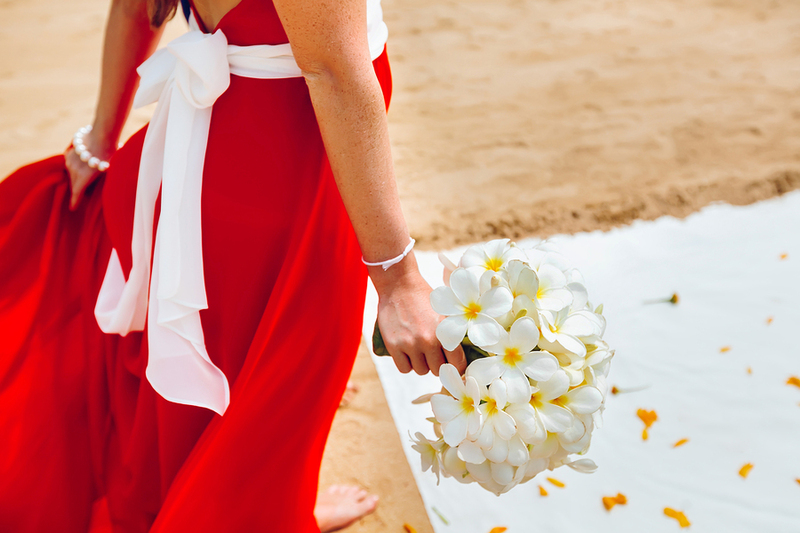 Even a wide white waistband on a red gown will make your look more traditional or red white wedding dress may feature the equal parts of both colors. - Or, you may opt for a white wedding dress with red accents. Thus, a red sash, ribbon or bow will add brightness to a wedding gown while it will remain absolutely classical. Also, white gowns with red lace appliques are rather widespread. - Also, all red wedding dresses look gorgeous with sparkling details. Sequins and crystals may be of the same color with the dress or of silver/gold colors. In fact, silver and gold details add luxury to any gown, but in combination with red, they create an unforgettable royal look. - Clearly, you may combine red with other colors as well. For instance, you may find beautiful red and black wedding dresses. However, they are more suitable for thematic and alternative weddings, for example, the one in gothic style. 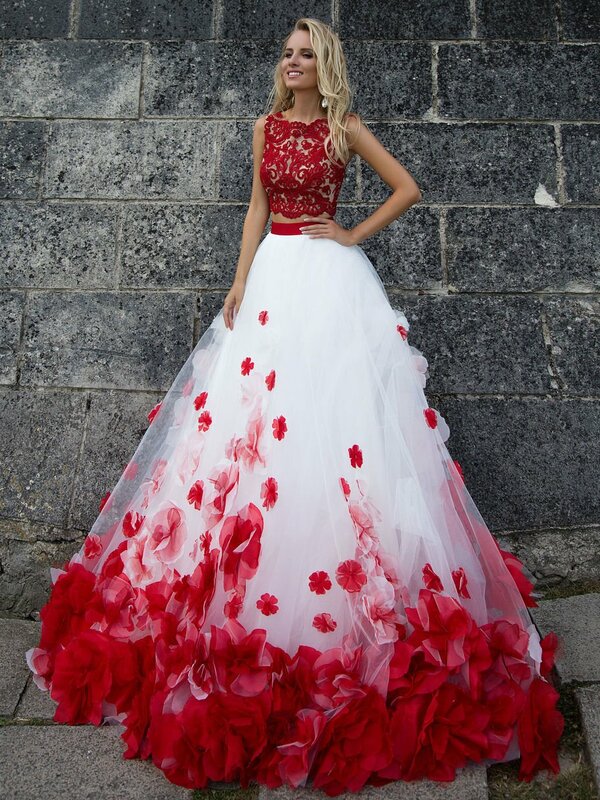 - If you are ready for experiments with red color, you may wonder where to buy red wedding dress. At first sight, it seems to be a problem as the wedding boutiques concentrate on the wedding gowns of traditional colors and have a few variants of pretty red wedding dresses. However, you may find a red dress at other stores. For example, seek for the dress at the boutiques, which sell evening and cocktail dresses. Or, if you plan a modest wedding, some simple variants may be found even at ordinary clothes shops. For instance, it’s highly possible that you may find short red wedding dresses at a clothes shop near your dwelling. - If you aren’t satisfied with the selection of dresses for sale, you always have a chance to sew a wedding gown. You can turn to a wedding designer or an ordinary seamstress. In such a way, you can create the dress, which suits all your requirements and which shade fits you perfectly. You are free to select not only the silhouette and style but adornments and minor details as well. Ready for some red wedding dresses inspiration? Here are 5 cool ideas of the bridal gowns in red. Red wedding gowns with sleeves are less popular than the ones without them, but it’s impossible to resist this mermaid gown by Alex Perry. It’s made of satin crepe and features a beautiful lace back while the front is fully closed. This gown, which is a mix of modesty and sexuality, suits slim girls and the ones with beautiful body curves. It costs $2,418. The price is pretty high for a dress. It’s the major minus. Also, if you don’t have an ideal body, it’s not recommended to experiment with such fitted gowns made of satin crepe as they may highlight the imperfections. Of course, when we talk about colorful wedding dresses, we can’t omit Vera Wang. She has many cool red gowns in her collections, but we choose the iconic Katherine model in cardinal red color. It has a ball gown silhouette and features a strapless bodice. What we like the most is its complicated skirt with numerous ruffles, hand-made flowers and horsehair trim. Katherine dress suits the girls with almost any body type, except plus size brides and too petite ones. The dress price is about $10000. But you can find a pre-owned wedding dress for $4000-5000. We all know that Wang’s dresses are pricy, but they are a dream for many girls. Two-piece wedding dresses are very popular today. And why not opt for a red and white wedding dress, which consists of a lace red top and a white tulle skirt, adorned with flower petals? This dress by AnnaPromDress looks very unusual and creative. Clearly, in order to wear it, you need to have a slim waist. The price of the dress is $386 and so, it’s rather affordable for any bride. However, this dress won’t suit a plus size bride, the one with apple-shaped body as well as a girl with low height. If you plan a modest wedding, you can get a beautiful dress even for $160. Such is the price for the gown by Oleg Cassini. The dress features a trendy illusion bodice adorned with floral appliques and a keyhole back. The skirt is from polyester. The color is very unusual and it’s called apple red. Though the dress is advertised as the one for bridesmaids, it’s also suitable for the brides. The silhouette is rather universal and will look good at plus size and petite, small and tall girls. However, it may be unsuitable for girls with wide shoulders. The fans of lace will like this dress by Cinderelladress as it’s fully covered with lace. 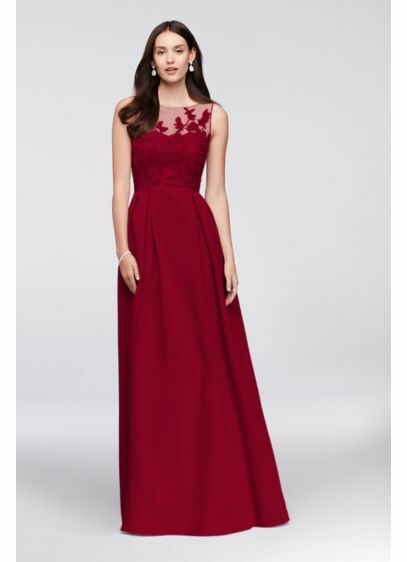 The ruby red color looks amazing as well as the ball gown silhouette. The dress features spaghetti straps and a low back, which will allow to show your beautiful back. The dress is rather cheap and costs about $150. And so, it’s a good variant if you are tight on a budget. Though the dress doesn’t feature the expensive lace, it looks rather decent for a bridal dress. Moreover, it suits the brides with all body types. All in all, the choice of the wedding dress color is a very personal issue. If you opt for a red one, you are definitely a person, who likes attention and doesn’t afraid to be misunderstood by others. No matter if you chose among ball gown red wedding dresses with sleeves or short ones with heart-shaped bodices, you will definitely be the main star of your fabulous day.